St. Mark's (Il Basilico di San Marco) side facing the Piazetta and Lagoon. 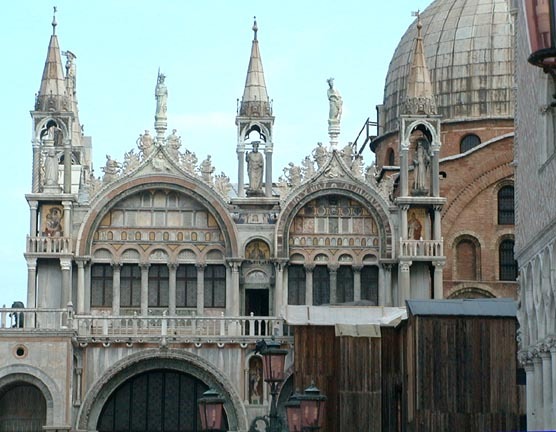 The roofline, statues, varied marble panels, and dome are visible, as is the edge of the Palazzo Ducale. The Stones of Venice which mentions "reading a building as we would read Milton or Dante" (10.206), explains that St. Mark's "is to be regarded less as a temple wherein to pray, than as itself a Book of Common Prayer, a vast illuminated missal, bound with alabaster instead of parchment, studded with porphyry pillars instead of jewels, and written within and without in letters of enamel and gold" (10.112).